Ladies and gentlemen, try and keep calm. We've got a giant robots alert. I repeat, we have a giant robots alert. Ok, maybe don't keep calm, after all. Giant robots are awesome. And you certainly get plenty of them in Iron Wars. 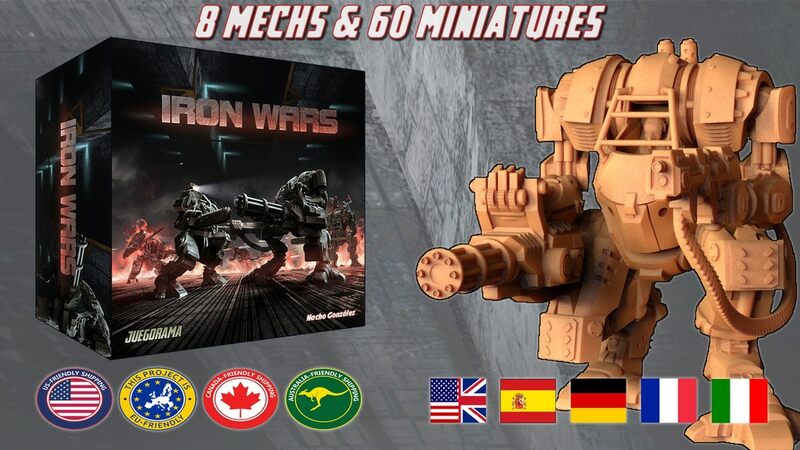 It's a sci-fi tactical miniatures game where players pilot their mech suits against their opponents, or possibly cooperatively against a common foe, as the game has both modes of play in it. They've relaunched on Kickstarter and the new campaign is going now. Co-op and competitive modes: Co-op with exploration map. 2 campaigns with 8 Missions each campaign and 8 short missions. Competitive with 10 pre-set Missions, Death Match and Arena modes. Co-op Missions with Map generation, pre-set or Mixed Map. You are a Mercenary company, select your Mechs and fighters, hire your mercenaries and improve your Mech to win. Available in English, Spanish, German, French and Italian: You’ll be able to choose the language during the pledge manager phase, after the campaign ends. They're right around halfway to their goal with still 15 days left to go.